Click on the links below to download the PDF of the study. Method: Changes in peripheral blood smears from 38 subjects were observed using peripheral live blood cell imaging (LBCI) with phase contrast microscopy. Observation of changes in properties of live blood was made and compared to placebo and baseline at five and 30 after administration. Results: Compared to baseline and control, the VMP35 formulation SK713 SLP technology effected positive changes in the blood. They were demonstrated by morphological, hematological and rheological changes observed five minutes from the intake and were sustained at least 30 minutes post intake. Conclusions: These observable changes showed that the SK713 SLP system can make a key contribution to increasing the potential benefits of dietary supplementation for those patients with compromised digestive processes. We encourage additional research on the effects of this novel neutraceutical formulation and delivery system. Keywords: digestive malfunction live blood cell imaging, peripheral blood smear, cell aggregation, rheology, phospholipids, nutrient encapsulation, multinutrient complex. According to the Center for Disease Control, after accidents, digestive disorders are the number one reason for emergency room visits in the US [1, 2]. Digestive-malfunction in terms of impaired disintegration, dissolution, and absorption of food and nutrients is a widespread malady; it is also an exacerbating factor in most chronic degenerative diseases. Prescription and OTC drugs for digestive distress are among the most popular medications in the US, emphasizing the importance of this disorder. Effective digestion of food, food constituents, and for some, dietary supplements are essential for maintaining health. Liposome structures are safe, biodegradable, and biocompatible . In addition, the liposome structure can be adequately and rapidly absorbed by the sublingual mucosal membrane. In doing so, they can accommodate both water-soluble and fat-soluble vitamins, trace minerals, and naturally occurring phytonutrients including flavonoids, terpenes, and saponins . The purpose of this experiment was to observe changes in live blood to evaluate absorption following the sublingual administration of VMP35 SK713 encapsulated nutraceutical formulation. SK713 Soy Lecithin Phospholipid (SK713 SLP) nutrient Prodosome encapsulation technology employs a unique three-step manufacturing process. Step one is the production of the SK713 SLP compound and its impregnation and saturation with solar-dried electrolytes that supply free ions. This process amplifies the ionic properties on each level of the multi-lamellar sphere. Step two is an advanced wet milling pre-treatment of the nutrient components to be combined with SK713 SLP. The final step involves specific blending methods for combining the components into a thoroughly homogeneous nutraceutical compound. Effective multilamellar liposomal encapsulation requires precise control over the SK713 SLP manufacturing as well as the pretreatment and preparation of specific nutrient compounds. The process produces a finished nutraceutical that can be utilized for oral or topical delivery applications . multilamellar liposomes form spontaneously as the electrostatic and adsorptive properties lower surface tension (surfactant). The net result is thorough and complete phospholipid encapsulation (or entrapment) of nutritional ingredients within multiple layers of nano to low micrometer-sized spheres. This electrostatic encapsulation is effective for encapsulating and transporting both water and fat-soluble nutritional ingredients including phytonutrients within the same spherical structure.[8,9]. Many nutritional compounds, especially inorganic minerals and resinous phytonutrients, do not dissolve well in water. Prior to SK713 SLP processing, all materials are pre-processed using a low sheer tri-blender jet-compression-particle-processing technology. Previously insoluble materials can now be blended into the aqueous base made of the high-grade lecithin (>85%PC) combined with alcohol. The SK713 SLP material can then be blended into the liquid nutritional compound. Importantly for human consumption, the transport vehicles or spheres are comprised of all natural GRAS ingredients (Generally Recognized As Safe). The SK713 SLP multilamellar sphere contains large quantities of electrolytes and hydroxyl-rich botanicals that contribute bioflavonoids and assist in maintaining healthy pH, proper hydration, and the transport and utilization of vital nutrients (see Table 1). The SK713 SLP sphere is also a zwitterion, methyl donor, and potential alkalizing buffer . Zwitterions carry both positive and negative charges. They may lower the energy requirement for transporting molecules thereby enhancing absorption by spreading the nutrient out over a larger surface area , are soluble in water and highly soluble in solvents. The SK713 SL phospholipid spheres also have a natural ‘adhesive’ property that enhances the ability of the body to absorb their nutritional contents. 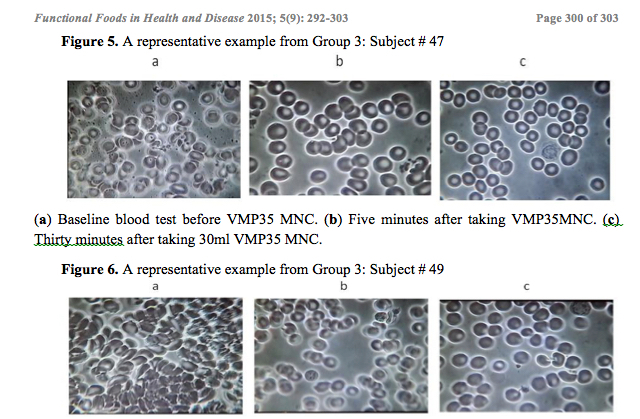 Changes in properties of live blood, following the sublingual administration of VMP35 SK713 encapsulated nutraceutical formulation were observed, recorded and compared to placebo and baseline, at five and 30 minutes after administration. Live blood cell imaging (LBCI) was performed by Veritas Health in Woodbridge, Ontario, Canada, using an Olympus BX-30 light microscope with a Phase Contrast Condenser to visualize samples. A 150-watt lightbox with fiber optic cable assembly was used to highlight the specimen against a gray field and increase the range of intermediate shades. The lighting produces a high level of cell definition, clearer morphology and can distinguish features of some cell walls. The lens configuration was 10x eyepiece and 100x-oil -immersion objective magnification, to achieve approximately 1000 times magnification. Oil immersion achieved finer resolution and brightness. Peripheral blood smear (PBS) was performed by puncturing the finger with a Bayer Single-Let Disposable Lancet 23G 2.25mm sterile single-use lancing device. A small amount of capillary blood was allowed to exude and collect spontaneously on the fingertip without squeezing the finger. The blood was transferred directly onto a microscope slide without touching the slide with the finger. The slides used were pre-cleaned standard 1 inch by 3 inches with a thickness of 1 mm supplied by Electron Microscopy Sciences. The slide was covered quickly and gently with a cover glass without pressure to protect blood cells from damage. The cover glass was pre- cleaned #1 22mmx40mm with 0.13 to 0.17 mm thickness supplied by Electron Microscopy Sciences. The corners of the cover glass were tapped carefully to disperse surface tension and create an even layer for viewing. The slide was then transferred directly to the microscope for viewing. Evaluation of blood properties began in less than 30 seconds after the blood was taken from the finger. Consistent blood extraction and handling procedures were followed to avoid artifacts. This observational, prospective, controlled cross-over study was designed to evaluate the effect of trans-mucosal administration of SK713 SLP encapsulated VMP35 MNC (active) as compared to baseline and commercially available bottled water (control). This study was approved by the Path Foundation NY IRB on April 25, 2013 (#13-009) and all subject signed a consent. Changes in peripheral blood smears (PBS) were observed using Live Blood Cell Imaging and Phase Contrast Microscopy . The 38 subjects were recruited at random from medical health clinics during interviews in Woodbridge and Perth Ontario Canada (see Table 2). There were ten males and 28 females ranging in age from 12 years to 82 years with an average age for males of 49 years and for females of 46.8 years as seen in Table 2. Subjects were assigned randomly into one of three groups and underwent PBS LBCI as seen in Table 3. Table 3. Blood tests timing. After the baseline, PBS Group 1 (n=8) consumed 30 mL water with a follow-up PBS taken at 5 min. Both active groups Group 2 (n= 26) and Group 3 (n=7) consumed 30 mL of VMP35 liquid MNC with a follow-up PBS at 5 min. Thereafter, Group 2b had an additional PBS taken at 30 minutes. Group 1 then consumed 30 mL of VMP35 MNC and had a PBS at 5 min after intake. A non-blinded comparison was done between the baseline and subsequent PBS samples. Pictures were taken of each phase of the study, for each group changes in morphological, hematological and rheological characteristics were recorded. Videos (not submitted for publication) of the changes confirmed rheological changes following the VMP35 MNC intake. 3rd Blood Test 5 Minutes After VMP35 MNC. 2nd Blood test 5 Minutes After VMP35 MNC. 3rd Blood Test 30 Minutes After VMP35 MNC. The subjects in Group 1 were first given 30 mL of commercially bottled water (control). Group 2 and 3 were given 30 mL of VMP35 liquid MNC (active). At 5 minutes, all participants were subjected to a PBS LBCI. Group 3 was reassessed at 30 minutes. Group 1 was then crossed over taking 30 mL of VMP35 liquid MNC and assessed at 5 minutes. (a)Baseline blood test before VMP35 MNC. (b) Five minutes after taking 30 ml VMP35MNC. Thirty minutes after taking VMP35 MNC. Baseline and the 5-minute samples in the control group observations included aggregation and immobility – a sludge effect; malformation and damage and extensive hypo-chromic state (i.e. an oversized ‘donut hole’ evidencing reduced hemoglobin). At baseline, extensive ‘debris’ in the plasma and ‘dwarfed’ white blood cells (WBCs) were also observed. A cross-section of ages and a variety of conditions (see Table 2) were represented by the subjects so that the individual baseline blood smear examples shown in the figures do not look similar. Post-supplementation RBC improvements after 5 minutes included a breakup of aggregation and splaying out of RBCs on the slide; improved RBC spherical formation and a progressive reduction (with time) of hypochromicity. Other post supplementation observations include improved movement and ability to flow (rheology) of RBCs in plasma, evidence of improved hydration, reduced viscosity, and reduced surface tension. greater cellular aggregation and reduced hydration. See examples in Figures 5 and 6. 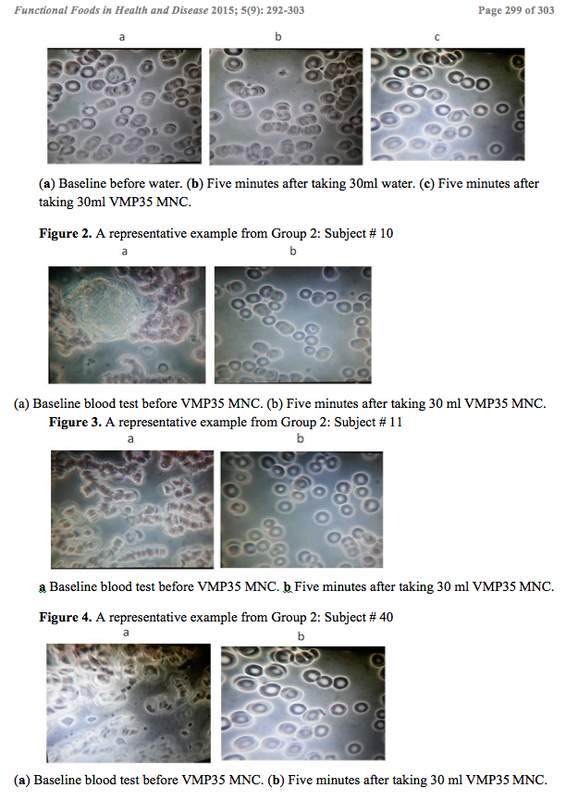 Overall, improvements in the splayed arrangement, size, form, density and distribution of RBCs following the intake of the VMP35 MNC were observed. In this experiment, RBC and blood rheology improvements were observed demonstrating that VMP35 nutraceutical encapsulated within the multilamellar SK713 SLP Prodosome architecture was delivered and absorbed by sublingual trans-mucosa within 5 minutes. PBS LBCI offers a unique ability to observe the rapid onset of hematological changes in response to interventions . The objective of using PBS LBCI in this study was for it to serve as a time-sensitive marker of biological perturbation and as a visual analytical tool for the degree of response to the delivered bioactive nutrients. The central finding was that changes occurred within 5 minutes of administration of VMP35 MNC and were sustained for at least 30 minutes. Conversely, no such changes were found when the equivalent volume of water was ingested by the control group, which adds credibility to the baseline findings and demonstrates reproducibility, in the absence of active intervention. On the other hand, the prompt, sustained and progressive findings in the active groups; Group 2 at five minutes and Group 3, at 5 and 30 minutes supports the validity of the observations. This conclusion is further strengthened by the observations of similar findings in Group 1 during the active cross-over phase. Bioactive effects were observed. This evaluation demonstrates that the SK713 SLP delivery technology exerts rapid positive effects on morphological, hematological, and rheological properties of the blood. This rapid response also suggests that the SK713 SLP technology efficiently delivers nutrients into the blood via the sublingual mucosa in less than 5 minutes from the intake. Although blood levels of the major bioactive ingredients in the blood are required to determine the bioavailability and bioactivity this speedy sublingual delivery may, however, overcome digestive inefficiencies of those with various underlying digestive pathologies [5, 8, 13-14]. We are also proposing that the entire SK713 SLP process could also help the remaining nutrients disperse over a larger surface area within the small intestine. The low-sheer tri-blender jet compression technology decreases the particle size of larger and more granular or resinous materials. The smaller particle size of a particular nutrient will allow this nutrient to cover a broader surface area once it reaches the small intestine. We speculate that the SK713 SLP spheres provide protection of the encapsulated nutrient contents within the multilamellar structures against the harsh acidic environment of the stomach. Our notion is that this protection enables the nutrients within the spheres to reach the small intestine intact, which should promote greater nutritional synergy in absorption and utilization . Interestingly, variations in this type of delivery technology have been the focus of many pharmaceutical companies to enhance drug delivery [13, 14]. In addition, a liposomal delivery system been shown previously to improve the bioavailability of alendronate in rats , this Prodosomal (more advanced liposomal delivery) technology was devised to simultaneously envelope a diverse range of nutrients including more granular or resinous materials. In this experiment PBS LBCI is not intended for any diagnostic evaluations as this imaging technology has not been considered appropriate for such applications. However, using PBS and LBCI, RBC and blood rheology, improvements and changes in the LBC morphology were observed at the intervals tested. There was no measurement of the level of the major bioactive ingredient in the plasma or red blood cells at times 0, 5 and 30 minutes. Future research that assesses levels of the major bioactive ingredients in the blood is required to determine levels of absorption, bioavailability and bioactivity, not measured in this study. The design of any future studies will be double blinded and include quantification using statistical analysis. CONCLUSIONS: The results of this observational study provide support that a Phospholipid Prodosome SK713 SLP nutrient delivery technology compared to placebo rapidly and effectively delivered nutraceuticals into the blood. As such, the SK713 SLP system, following required additional research, makes an important contribution towards increasing the potential benefits of dietary supplements. We encourage additional research on this novel delivery system and the positive collateral changes observed in other properties of the blood must be noted and merit future investigation. Competing interests: B. William Downs, Stephen Kushner, and Kenneth Blum have ownership interest in Victory Nutrition International. Ted Aloisio did not have any financial interest when carrying out this non-blinded study. Ted Aloisio’s spouse became an independent representative of Victory Nutrition. There are no other conflicts to report. Author Contributions: The design of the study was a team effort primarily involving B. William Downs, Stephen Kushner and Ted Aloisio. The technology was developed by Stephen Kushner; with the assistance of B. William Downs. Ted Aloisio performed the experiments. The interpretation of these data was further evaluated by Kenneth Blum, PhD, and Frans J. Cronjé. The manuscript was written by both B. William Downs and Stephen Kushner. Kenneth Blum extended the writing and provided the basis of the final manuscript. The final submitted manuscript was approved by all authors prior to submission. Acknowledgments and Funding: The authors would like to thank Margaret A. Madigan for her expert edits of the entire manuscript. The authors would like to thank the research staff of Victory Nutrition International, Inc, as well as Synaptamine, Inc. Ted Aloisio contributed reagents/materials /imaging tools. Nawar EW, Niska RW, Xu J: National hospital ambulatory medical care survey: 2005 emergency department summary. Advance data 2007, 1-32. Koerner MM, Palacio LA, Wright JW, Schweitzer KS, Ray BD, Petrache HI: Electrodynamics of lipid membrane interactions in the presence of zwitterionic buffers. Biophysical journal 2011, 101:362-369. Keller BC: Liposomes in nutrition. Trends in Food Sci Techn 2001, 12: 25-31. Shoji Y, Nakashima H: Nutraceutics and delivery systems. J Drug Target 2004; 12:385- 391. Scholfield CR. Composition of soybean lecithin. J Amer Oil Chem Soc 1981; 58:889- 892. Ambroziak A, Cichosz G: [Milk phospholipids as nutraceutic]. Pol Merkur Lekarski 2013, 34:62-66. Akbarzadeh A, Rezaei-Sadabady R, Davaran S, Joo SW, Zarghami N, Hanifehpour Y, Samiei M, Kouhi M, Nejati-Koshki K: Liposome: Classification, preparation, and applications. Nanoscale Res Lett 2013, 8: 102. Helfrich W: Distributions of vesicles: The role of the effective rigidity of membranes. J Phys 1984, 47(2): 321-329. Bouchard, G.; Pagliara, A.; Carrupt, P.A. ; Testa, B.; Gobry, V.; Girault, H.H. Theoretical and experimental exploration of the lipophilicity of zwitterionic drugs in the 1,2-dichloroethane/water system. Pharmaceutical research 2002, 19:1150-1159. Popescu G, Park Y, Choi W, Dasari RR, Feld MS, Badizadegan K: Imaging red blood cell dynamics by quantitative phase microscopy. Blood cells, molecules & diseases 2008, 41:10-16. Popescu G, Ikeda T, Best, CA, Badizadegan K, Dasari RR, Feld MS:. Erythrocyte structure and dynamics quantified by hilbert phase microscopy. Journal of biomedical optics 2005, 10. doi:10.1117/1.2149847. Akbarzadeh A, Samiei M, Joo SW, Anzaby M, Hanifehpour Y, Nasrabadi HT, Davaran S: Synthesis, characterization and in vitro studies of doxorubicin-loaded magnetic nanoparticles grafted to smart copolymers on a549 lung cancer cell line. J Nanobiotechnology 2012, 10: 46. doi: 10.1186/1477-3155-10-46. Valizadeh A, Mikaeili H, Samiei M, Farkhani SM, Zarghami N, Kouhi M, Akbarzadeh A, Davaran S: Quantum dots: Synthesis, bioapplications, and toxicity. Nanoscale Res Lett 2012, 28: 7, 480. doi: 10.1186/1556-276X-7-480. Han HK, Shin HJ, Ha DH. Improved oral bioavailability of alendronate via the mucoadhesive liposomal delivery system. Eur J Pharm Sci. 2012, 46(5):500-507. doi: 10.1016/j.ejps.2012.04.002.